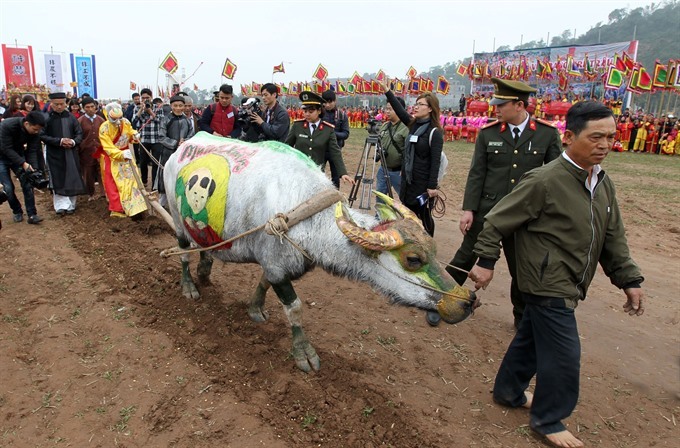 HÀ NAM — The annual Tịch Điền (Ploughing Festival) festival, held on the seventh day of the Lunar New Year, to pray for a year of bumper harvests opened in the Hồng (Red) River Delta province of Hà Nam on Thursday. The festival dates back to 987 during the Lê Dynasty when King Lê Đại Hành decided to plough in Đọi Sơn Commune, Duy Tiên District to encourage rice cultivation. The practice became an annual tradition held through many dynasties before falling into oblivion under the reign of King Khải Định of the Nguyễn Dynasty. It was restored in 2009. Rituals held within the festival include the procession of a huge drum and King Lê Đại Hành’s ancestral tablet from Long Đọi Sơn pagoda to the foot of the Đọi Mountain, where it merges with the processions of the village’s guardian god and the father of Đọi Tam drum-making. The procession then proceeds to the land where King Lê Đại Hành ploughed. This is followed by a ceremony to pay homage to the God of Agriculture to pray for a high-yield season and prosperity. A respected elderly farmer representing the local people assumed the role of King Lê Đại Hành to pray to ancestors and the god of farming. The farmer, dressed in a nine-dragon hat and royal robe, then descended to the field to plough. He was followed by a crowd throwing green pea, peanut and rice seeds. Other activities are traditional wrestling, drum performances and buffalo decoration.